If you are trying to get your hands on the best motorcycle rain gear available, but you don’t have the time to read all the info that you can find online, we can help you out. After doing the legwork on your behalf by reading plenty of specialized reviews and guides, we have determined that the Joe Rocket Survivor Riding Suit is the product that you should invest in. This model is made from a waterproof outer shell, and it has C. E. rated armors in the knees, shoulders, and elbows so that you are adequately protected when riding your motorcycle in bad weather. Moreover, the product has triple closure outer pockets, and it comes fitted with reflective strips and logos. Because of this feature, the other drivers will surely see you on the road. If the Joe Rocket Survivor Riding Suit is unavailable, feel free to check out the Joe Rocket RS-2 Men’s Suit. This all-body suit is convenient and comfortable and will keep you feeling warm and cozy even as the rain is pouring down on you and your motorbike. It is outfitted with a waterproof outer shell that’s CE-rated, and it even features a spine protector incorporated in its design. Besides, there is also a practical ventilation system that you can take advantage of if the weather’s hot. The regular length can be a tad too long for some customers. This waterproof suit is CE-rated, so that should give you a clue as to whether it can protect you or not. It’s also quite resilient. 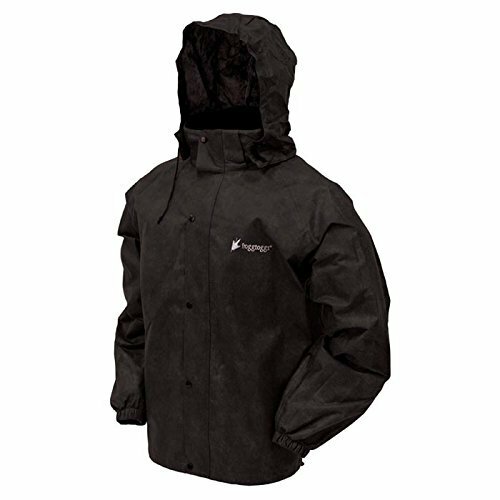 The waterproof soft polyester outer shell boasted by this alternative should give you a pointer as to whether or not it can keep you safe and protected from inclement weather. The reflective strips that the model is outfitted with will make you visible on the road, so they are a nice safety-related addition. You can keep essential belongings in the two sizeable pockets of this suit. The legs open with a zipper and the material might get caught. This suit is safe, easy to wear, and convenient. The two pockets that it comes with will allow you to carry important essentials. Unlike some other models we’ve come across while doing our research, this Frogg Toggs choice was built from polypropylene, which is widely known for being waterproof. Some of the user-friendly features of the jacket range from an adjustable and detachable hood to a fully adjustable waist. The pants come with an elastic band, so sizing them properly might be less of an issue. Unfortunately, there are no pockets on this suit, and that’s inconvenient. This polypropylene two-piece suit can keep you dry and cozy on rides you need to take while the rain’s pouring down on you. 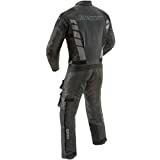 Finding the best motorcycle rain suits available is not easy, especially if you don’t know much about the topic. To help you out, we have composed a list items that you should not forget to check out before you start shopping. These products have received excellent reviews, and they are considered good purchases by specialized reviewers. If you are searching for a product that will definitely look well when combined with your new modern motorcycle gloves, we suggest that you give the Survivor Riding Suit designed by Joe Rocket a good look. Apart from having an eye-catching design, this product was made by using high-quality materials that can keep you safe and dry during rainy days. In fact, this model features a waterproof outer shell that has been C.E. rated. An additional pocket where you can fit a spine protector is also incorporated into the design of the item. Moreover, the product also includes a practical ventilation system that can keep you comfortable during the summer. As a plus, this model has reinforced shoulders, knees, and elbows. What is more, the 14 point adjustment system is also a feature of the product that many current users of the unit have spoken highly of. If you are into sports-looking gear, this RS-2 Men’s Suit produced and sold by Joe Rocket is another product that you should consider. 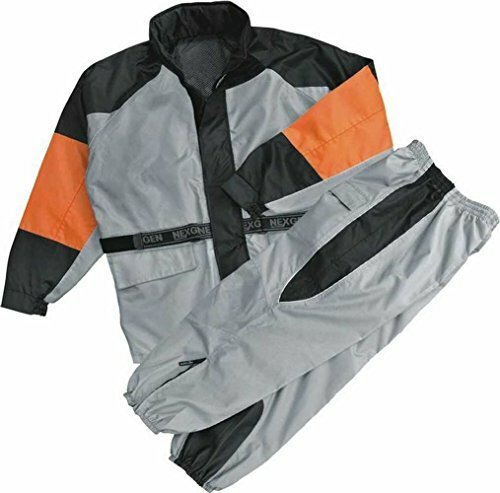 This rain suit was constructed to feature a waterproof soft polyester outer shell that has extra PVC backing for added protection. Even more so, this unit is outfitted with a full-length zipper that is quite effortless to use and a Velcro storm collar and flap. Additionally, the product features a nylon liner, two sizeable exterior pockets that have gusset expanders and reflective strips that will keep you visible while riding. The model also includes a ventilation system on the back for extra comfort on warm days. The model consists of two pieces, a jacket and a pair of pants (the lower leg area of the pants is made from a melt-resistant fabric). Furthermore, the product has been tried and tested by many happy users that recommend it to other interested motorcyclists. 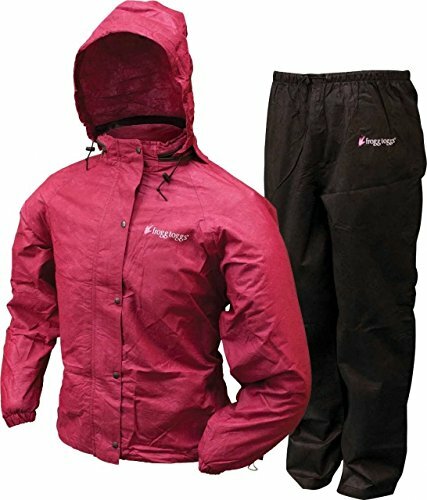 Another price efficient product that is likely to stir your interest is the All Sport Rain Suit by Frogg Toggs. This model is also a two-piece ensemble that guarantees to keep you dry during the rainy season. To better cater to the needs of its buyers, the manufacturer has built it from polypropylene, a type of material that it is renowned for its water resistance. On the one hand, the jacket is said to be easy to move in and overall quite comfortable. Moreover, it features an adjustable and also detachable hood, and it has a fully adjustable waist that you can modify in accordance with your preferences and necessities. On the other hand, the pants come fitted with an elastic band and a cord lock. Their classic straight-leg design is effortless to wear, and the four panel cut that they include is very flexible. Lastly, it is worth saying that the product is quite lightweight when compared to other models. If you want to purchase a product that will undoubtedly make you effortless to see on the road, you might want to check out the Scoyco RC01 Motorcycle Rain. This model was manufactured from a 5000mm super waterproof material that is very dependable. What is more, this product has been specially designed to be used by motorcycle and motocross riders. On top of that, this unit also includes large pockets that are placed on both sides that can be used for storing your personal belongings in them. Additionally, this polyester suit is often described as breathable and highly efficient. Nonetheless, before you make a purchase, you should know that previous buyers recommend that you order a size larger as the product runs a bit small. This feature is especially important if you intend to wear other clothes (and maybe thicker ones) underneath it. The unit comes in four sizes that you can choose from. 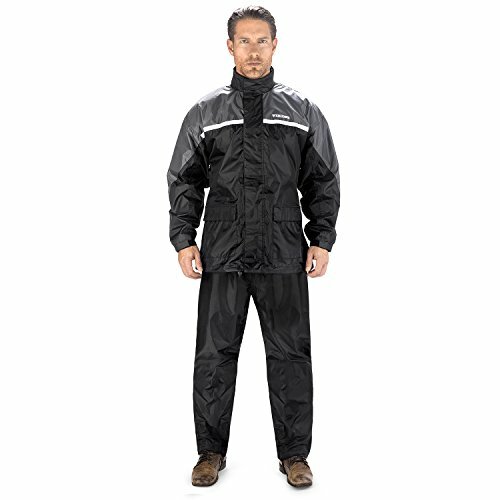 Another product that you might want to think about is the Nelson-Rigg Stormrider Rain Suit. The two-piece model stands out because it is highly visible and very cozy. What is more, this model includes what the manufacturer calls a soft polyester outer shell that has PVC backing for extra security. Besides, the jacket also features a full-length zipper that has a Velcro storm flap that you will definitely come to appreciate. Moreover, the two large pockets that are placed on the front part of the suit are quite large. Additionally, this model has an inner collar made from soft corduroy, a hood and two practical cooler vents that are located under each arm. The waist of the pants/jacket is elasticized, and the cuffs are fully adjustable. Last but not least, the pants also feature zipper gussets that measure up to 17’ as well as elasticized boot stirrups. If you are searching for a model that will surely match your motorcycle boots, look no further than the NexGen Men’s Rain Suit. 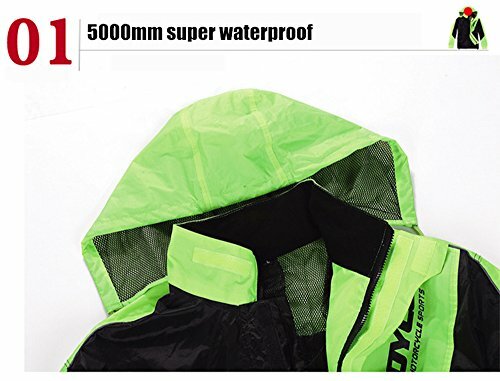 The product is particularly suitable if you are a motorcycle long distance rider that is trying to find a product that can keep him/her protected from the cold and the rain. The model has a sturdy design, and it is said to provide a good fit to most of its buyers. This is a two-piece product that is 100% water resistant and, thus, great for the job. Furthermore, the leg area of the suit is built from a heat-resistant material that prevents it from melting from the hot pipes on your ride. Additionally, the jacket included in the price has elastic cuffs. Finally, you should know that this product can also be worn over your regular motorcycle gear. However, if you intend to do so, make sure that you purchase the next larger size. If you are a woman in search of an all-purpose suit that can also be used while riding a motorcycle, this model sold by Frogg Toggs might be suitable for you. The product has a simple cut design, and it is said to be quite versatile. The suit is made from two parts, a jacket and a pair of pants. 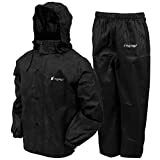 Both the jacket and the pants are waterproof and windproof so that the person wearing them is fully protected from the elements. Besides, the jacket comes provided with a full zipper and a button front closure. Although this model is waterproof, you should know that the item is also breathable, which is a reason why so many current users appreciate it. Moreover, the suit is said to be very lightweight and, thus easy to wear as it won’t restrict your movements. According to some reviews, the sizing of the model is accurate, and the large cut of the model enables the user to wear additional clothing underneath it. Another model that you might be interested in is the one produced by the Milwaukee Motorcycle Clothing Company. 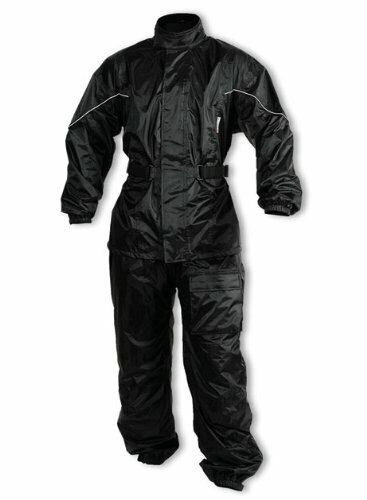 This fully lined rain suit is made up of a comfortable jacket and a cozy pair of pants. Both the jacket and the pants are constructed from water-resistant, heavy-duty nylon that is highly breathable. Moreover, the jacket was designed to have a generous cut so that its users can move freely in it, in accordance with their needs. Despite this feature, the front zipper of the jacket includes a Velcro over-fly and adjustable elastic that will help you withstand the rain and the wind. The pants of the suit have an elastic waistband, and they also feature an elastic cuff that can be fitted over your boots. This way, you will be 10% protected against the cold rain. Both the jacket and the pants are fully lined. The product has overall good reviews, and it is often regarded as a cost-efficient purchase. If you are a fan of one-piece rain overalls, we recommend that you give the IXS Orca Evo Rain Suit a go. This model has been constructed from a water-resistant PU coated nylon, and it also includes a nylon mesh lining in the top. In order to cater to the necessities of its users, the manufacturer has also fitted the model with a reflecting logo on the back, and a reflective cording on the chest. Because the product was designed to be worn by users who use resistant dirt bike and motocross helmets, it does not feature a hoodie or a hat. Moreover, you should know that, differently from other products, this suit does not include a ventilation system. Therefore, this model is not as breathable as other similar counterparts. Likewise, some users of the model have noticed that this suit does not feature resistant panels in the inner thigh areas. Another two-piece design that might interest you is the product sold by Viking Cycle Motorcycle. The item is made from waterproof fabrics and it comes supplied with sleeve cuffs and an elastic hem. Additionally, the calf area of the leg is protected by heat shields that guarantee that the suit won’t be affected by the heat emitted by the pipes. The model has a stylish design that includes reflective piping and removable stirrups that you might find feasible. To make this suit even more efficient, the manufacturer has supplied it with two large pockets where the user can store essential supplies and cooling vents under each arm. Because of the cooling vents, you will no longer feel too warm while wearing rain gear. The product comes in six different sizes. To select the unit that best fits you, be sure to check out the sizing chart made available by the seller. 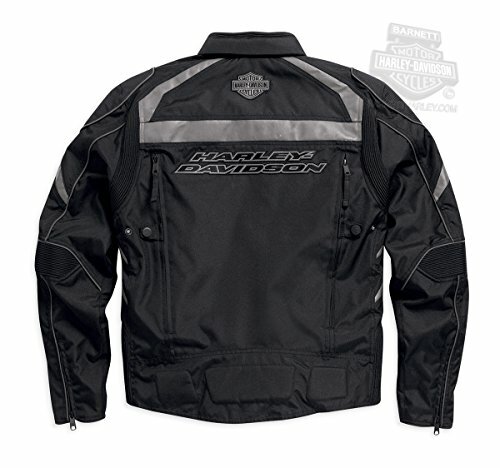 If you are scouring the net trying to find a jacket that matches your stylish motorcycle gloves, we suggest that you take a good look at the model sold by Barnett Harley-Davidson. This manufacturer describes its product as 100% waterproof. In fact, this model is constructed from polyester, and it has a mesh body lining and sleeve lining for extra comfort. What is more, the unit has two vertical vents that include snap tabs and two back exit vents that you will surely find practical. Moreover, the jacket includes body armor pockets at elbows and shoulders and a snap-tab collar. The sleeves of the product are said to be slightly pre-curved. The model also includes zipper chest pockets and horizontal interior pockets that you can use for storing your phone and other belongings. The jacket also features reflective piping and stripes that will make you noticeable to the other drivers. If you are searching for a brand new pair of motorcycle overpants that are highly breathable, take a good look at the model sold by HHR. This product has a Cordura construction that guarantees that this model is breathable and practical. 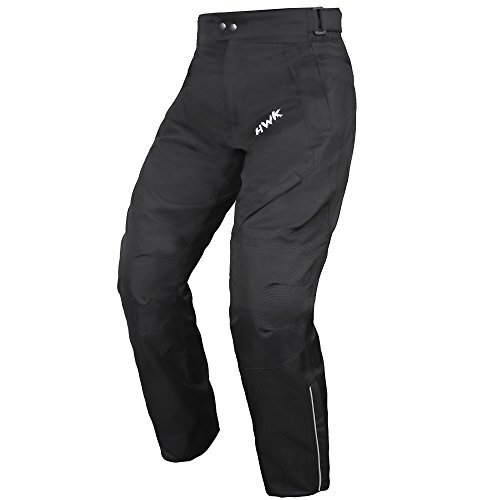 Even more so, these pants have waterproof lining and underneath mesh lining so that they can protect you against the effects of unfavorable weather. Previous buyers of the model have appreciated that this unit has well-created pockets and useful zippers that make it easy for one to put it on/take it off. Similarly, it has been said that this model has an excellent fit and that its high-quality material is worth one’s consideration. On top of that, the microfiber material utilized in making them guarantees that these pants are highly durable in the long run. If you want to wear these pants over your regular trousers, make sure that you purchase a bigger size. If you are a fan of Joe Rocket gear, these riding gloves should unquestionably make it to your shortlist. The model has been designed to ensure that motorcyclists have their hands protected from cold wind and the rain. The product comes provided with a drum dried Cowhide outer shell and a mid-liner that is 100% waterproof. In addition to that, the model features insulation and extra high-density knuckle armor for additional safety. Additional leather reinforcements are also included, as well as a gel palm construction that can efficiently dissipate vibration. This way, you will have a better grasp while riding your motorcycle. The design of these gloves is slightly curved so that the user is satisfied with the grip. According to some of the prior buyers, this product runs a size small. Consequently, it might be a good idea to order a size up. If you have any trouble deciding on the appropriate measurement, take a look at the chart provided by the seller. If you want to purchase a pair of leather riding gloves that have an interesting design, why don’t you consider this product sold by TourMaster? The model has a leather palm and thumb construction that includes a 3mm EVA pad, polyester fleece lining, and efficient stretch knuckles. A leather throttle guard has also been included between the index finger and the thumb. The product has a pre-curved design that makes it easier for one to wrap his fingers around the grips. The gloves fit as expected and they are quite warm. As a plus, this product features reflective piping that increases the visibility of the model during nighttime. At the time that we have carried out our research, this product had received plenty of positive reviews from its previous buyers. Moreover, this device has been vetted by its current users as a reliable unit that is guaranteed to keep your hands dry and warm, even at low temperatures. Another stylish product that most motorcyclists are likely to love is the Burner On-Road model produced by Joe Rocket. Because it strives to provide its users with a superior grip and total control, the manufacturer has fitted these gloves with a silicone print. Moreover, for extra mobility and reduced fatigue, the model has a fully flexible wrist design that you will undoubtedly appreciate. 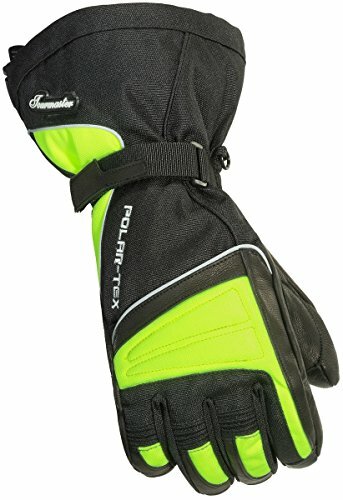 What is more, these gloves include adjustable cuff closures and a reflective logo. The product features an innovative three-stage heating system that runs on Lithium batteries. Each recharge is said to provide four full hours of capacity. Also, the material used to construct the fingertips of the model is conductive. Therefore, the users will be able to use touchscreens without having to take off the gloves. 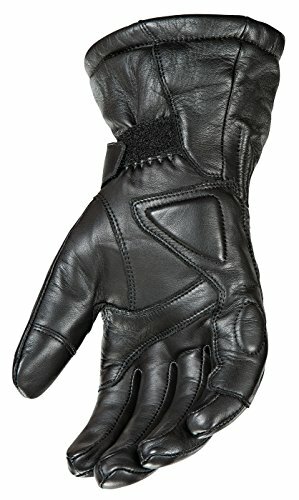 Lastly, these gloves are waterproof and breathable, all reason for which current users recommend them to all the interested motorcyclists that are in the market for a new acquisition. If you are searching for a pair of boots that have a sturdy design, we suggest that you check out the model designed by Forma. 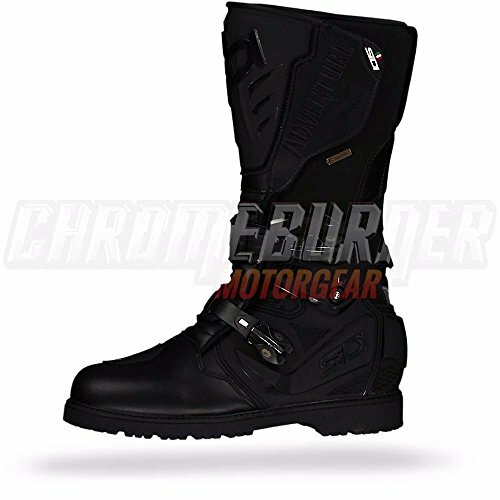 These boots feature a double density compound rubber sole and injection molded plastic protections that ensure their durability. Moreover, the product has ankle reinforcements and stiff nylon midsoles that are shock-resistant. Additionally, the product includes a soft polymer padding that has been developed memory foam for increased comfort for one’s feet. As a plus, the footbed of each boot is replaceable, and it is made from an antibacterial material. The plastic buckles that have to be used to secure the product are also replaceable and fully adjustable. Besides, because they are rather tall, it is advisable that you wear the boots over your pants (in fact, some users have said that it is somewhat challenging to pull jeans over them due to their design). 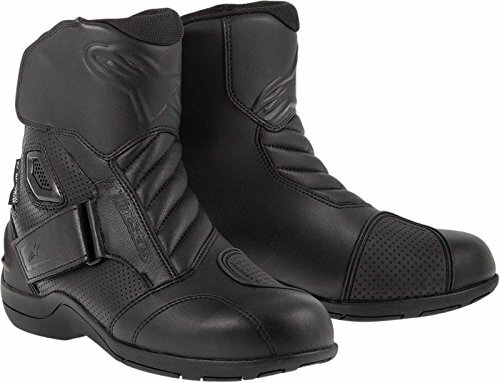 If you are interested in investing in a pair of street motorcycle boots, the model produced by Alpinestars Gunner might be just what you are looking for. Because it has been redesigned to be used by those that ride motorcycles, the product has a shape that is ergonomic and compatible with the commands of a bike. Furthermore, the layer between the upper cover and the lining is waterproof so that your feet remain dry while driving during in rainy weather. Also, the sole of the boots is made from a vulcanized material that has a unique side wrapping design so that you are protected at all times. Also, you should know that this product has been C.E. certified and it is, thus, capable of withstanding the demands of the road. However, because the model is all sealed (for weather protection), it does not feature a ventilation system. Nonetheless, current users recommend it as a good purchase. Last but not least, the Sidi Adventure 2 Gore-Tex is a product that is both modern-looking and likely to withstand the test of time. 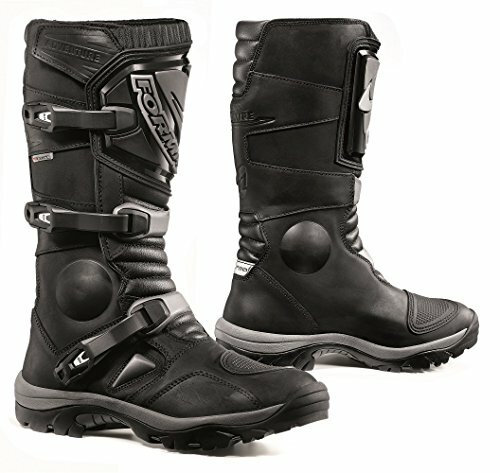 This pair of boots is the newer version of another product designed by Sidi, and it has been constructed by using high-quality materials. The model features an improved dual buckle system and the highly-acclaimed Gore-Tex membrane that ensures that the model is water resistant and breathable. To make the model durable, the manufacturer has combined the qualities of top grain leather with those of split grain leather. Even more so, the product includes both rubber soles and nylon inner soles that have arch support (that is removable). The heel of these boots is shock resistant so that the feet of the user are protected. Lastly, this model has a Velcro strap system and a cam-lock dual buckle system that guarantees that the product is safely secured in place while riding. The task of finding the motorcycle rain gear for sale is, by no account, an effortless one. The reason for this has to do with the fact that, interested buyers have to pay attention to many aspects that are not always that evident. To help you make a good purchase, we have composed a list of crucial features that you might want to keep in mind before placing any orders. 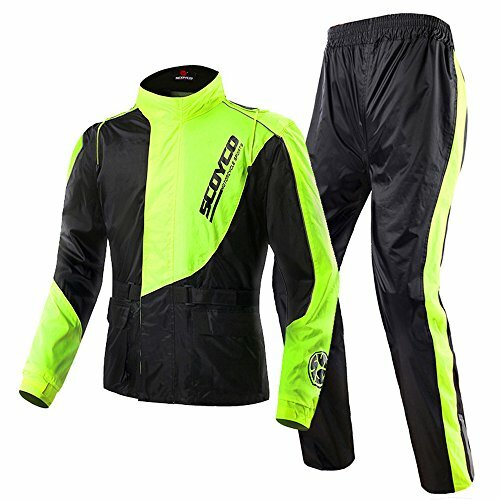 When trying to get your hands on good motorcycle rain gear, you should first pay attention to the material used in the construction of a product. Because you will wear the equipment during rainy days, it is crucial that you invest in a product that is waterproof. In other words, you should search for products that are double-stitched and that have sealed seams that can effectively prevent the water from infiltrating through the fabric. Even more so, specialized motorcycle rain gear reviews often suggest that it is best to purchase a model that has been constructed from waterproof fabric, rather than one made from water resistant materials. For example, if you take the case of boots, water-resistant models can only withstand to the penetration of water to some degree, while waterproof boots are made from materials that are 100% impenetrable by water. In short, while water-resistant items can keep you dry for a certain amount of time, investing in the best motorcycle rain boots that are waterproof means that you will remain dry at all time. What is more, according to the specialists, the same can be said about best motorcycle rain gloves. As a plus, good gloves have to have a pre-curved design that makes them particularly easy to maneuver. 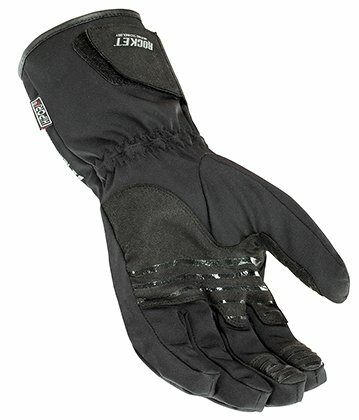 Also, if you intend to ride during the cold season, it might be a wise to purchase gloves that have a heating system. By doing so, you will not have to worry about your hands feeling cold. Furthermore, wet weather apparel should also be easy to put on and take off. Consequently, you should buy items that are a bit larger and that have zippered openings. However, because all uncovered zippers are predisposed to water infiltration, we recommend that you purchase a model that also includes a rain gutter or storm flap. For extra protection, you could also invest in a pair of motorcycle goggles. However, if you want to acquire rain gear that can be used while racing, it is best that you stick to skin tight clothing to avoid drag. Besides, before placing any orders, it is recommendable that you go online and verify whether or not the product that you like interferes with controlling the motorcycle. If previous users complain about this aspect, it is advisable that you do not purchase that given product. As you already know, riding on a rainy day can get tricky due to the low visibility. Because of this, the specialists suggest that the product that you purchase has retro-reflective striping or patches that can make you easy to spot by fellow drivers. Also, it is often recommended that, if riders happen to carry different items with them while driving; they place those items in waterproof, visible motorcycle backpacks. This way, they will have both of their hands on the steering wheel. Also, if you purchase a backpack, you will have enough room to keep your motorcycle jump starter in it. Consequently, if your ride stops working because of the rain, and it needs a jump start, you’ll have all the necessary supplies with you. What is more, if you want to be 100% safe while riding in bad weather, go ahead and read about the motorcycle airbag jackets and vests currently available online. Likewise, for added safety, you might also want to check out some proficient motorcycle neck brace models, as they might be life-changing in case of unhappy accidents caused by bad weather. Likewise, you should also make sure that your bike is equipped with proficient motorcycle tires that are suitable for the weather conditions. Another aspect that you should not overlook when shopping in this line of products is breathability. As you already know, in order to feel comfortable while riding it is crucial that the clothes that you are wearing are breathable. However, in an attempt to make their products waterproof, some manufacturers do not include vents in their gear. Nevertheless, if you want a model that will not cause you discomfort when worn for an extended period of time, it is advisable that you purchase a product that features moisture control. This is especially relevant if you intend to wear the gear during summertime. Seat mobility is another aspect that requires your attention. As expected, riding during rainy days in a suit that slips from the seat is a dangerous decision. To avoid this situation, you should buy a rain suit that features a fabric panel or a coating that stops the user from sliding on the bike’s seat. Moreover, the part of the pants that comes in contact with the exhaust pipes or the motor should also come outfitted with heat-resident panels that can protect the pants from melting. This feature is essential because it can save you a lot of money in the long run. Also, if you want to make sure that you are on the right track to your destination, seasoned riders suggest that you select one of the many motorcycle GPS units that you can find online. While searching for such a product, make sure that the device that you purchase is also waterproof. If you follow these recommendations, we are convinced that you will end up with durable and reliable raining gear. However, apart from investing in apparel that is appropriate for rainy weather, we recommend that, when riding in difficult meteorological conditions, you pay undivided attention to the road and the driving regulations. Also, remember that riding in heavy wind and rain is especially dangerous and, thus, when possible, it should be avoided.